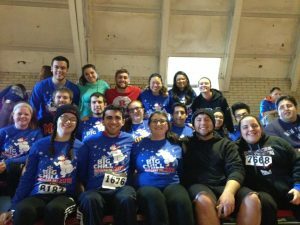 Several Alumni Brothers joined the active Brotherhood at Pi Chapter for the annual Big Chill 5k on the very chilly early December 3rd morning. 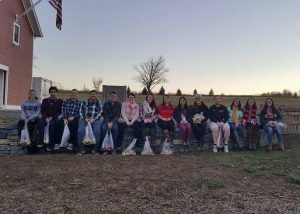 November was a month full of Brotherhood activites and bonding, starting with a hangout on November 6th at Melick’s Farm for apple picking! 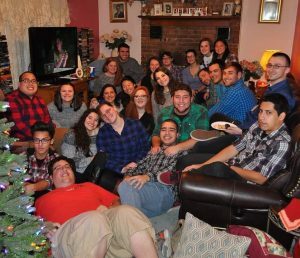 November 27th brought the annual Brotherhood Thanksgiving at Smiley’s house, a potluck and general get-together full of laughter and smiles. We’re thankful for all of our Brothers, near and far. October 23, 2016 – Scarlet Harvest! 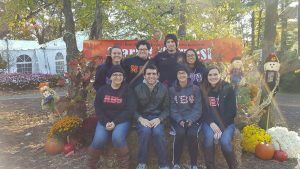 On October 23, Brothers headed out to the Rutgers Gardens to help the Rutgers Alumni Association with their annual Fall festival, Scarlet Harvest. Brothers spent the afternoon helping set up the grounds, and then assisting with a scavenger hunt and shooting a cornhusk cannon, alongside Rutgers alumni and Brothers of Alpha Zeta Fraternity. September 22, 2016 – MBPsi Hosts a Blood Drive! 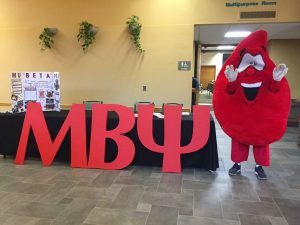 After the success we faced last semester running our first blood drive ever, we held our second drive on a Thursday, on Busch campus. Many Brothers donated, and we managed to collect 57 pints of blood that will go to hospitals and blood banks, where donations will be used for transfusions, surgeries, and many more procedures to help save lives. We thank everyone who came out and donated or helped us advertise! Starting on August 27, Brothers involved in the Rutgers marching band headed up to Lake Greeley Camp in Pennsylvania for a week of band camp! We spent the week bonding with the rest of the band and running successful nighttime activities for our fellow bandmates. Each night we also ran the Mu Beta Psi store, where we sold snacks and drinks for everyone. Pictured, Brothers on Tuesday after a Brother lunch. 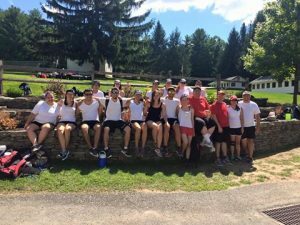 Front row, from left to right: Caitlyn Sullivan, Allyson Wagner, Michael Rehorn, Pat Zazzaro, Aarona Fong, Keri Kurpick, Anthony DeCristofano, Cassie Hill (staff), Michael “Smiley” Verra (staff), Todd Vaccaro Jr (staff), Casey Lau, Phil Muratore. Back row, left to right: Christian Rios, Amalia Hubal, Amy Oliveira, Michelle Mitchell, Rachel Parsons, PJ Amendolia. 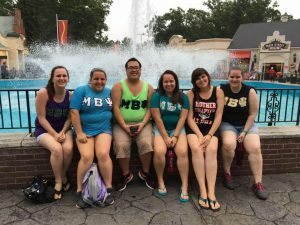 Brothers from Pi Chapter, Omicron Chapter, and Alpha Chapter met up in NJ to spend a day in the sun riding rollercoasters together and doing some Brotherhood bonding. 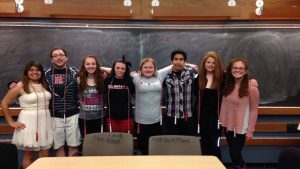 May 15th, 2016 – Congratulations Seniors! Pi Chapter would like to take a minute to thank our graduating seniors for all that they have done for us, and wish them luck in all of their future endeavors! April 10th, 2016 – Congratulations, Alpha Psi pledge class! 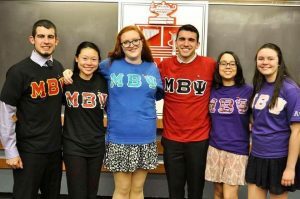 The Alpha Psi pledge class has finally become a part of Mu Beta Psi Pi Chapter! Along with that, they have also become a part of Mu Upsilon Alpha! Welcome! From left to right: Patrick Zazzaro, Aarona Fong, Rachel Parsons, P.J. Amendolia, Amy Oliveira, and Michelle Mitchell.